This Vegetarian Burrito Bowl Recipe has been sponsored by Earth Fare but all opinions expressed here are my own. I have a tendency to spend way too much money when I go to the grocery store. I am feeding a house full of very active and very hungry individuals and it shows in my grocery budget. We enjoy good food…plenty of organic, local, and high quality foods make it into my cart every week. One way I cut back on the cost of our meals is to serve vegetarian options a few times a week. Meat can be incredibly expensive, especially when you buy organic and sustainably raised varieties. However, meat is not a necessity in our diet. It can easily be replaced with a number of cheaper and healthier alternatives. On my recent trip to Earth Fare I stocked up on a number of protein alternatives for dinner this month. 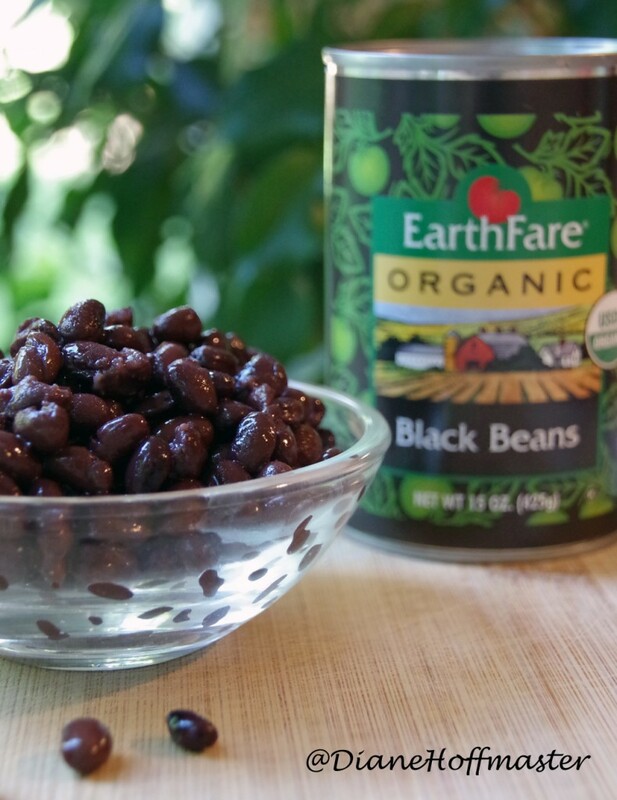 Black beans are one of my favorite vegetarian sources of protein and they are incredibly versatile. Scroll down a bit for my Vegetarian Burrito Bowl Recipe and keep reading for a few of my favorite Earth Fare shopping experiences! This was my first time visiting an Earth Fare grocery store and honestly, I was very impressed. 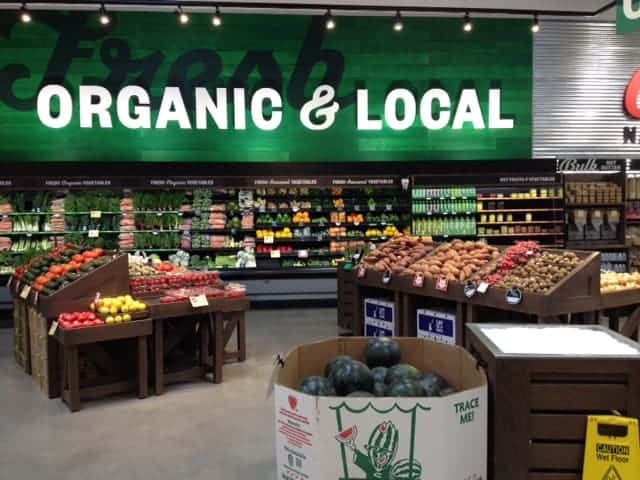 I loved the selection of produce and the fact that they were clearly labeled as organic, local, or conventionally grown. For people who are trying to reduce their carbon footprint, this system makes shopping incredibly easy. The produce was very fresh and I found everything I needed for my Vegetarian Burrito Bowl Recipe! One of my favorite parts of Earth Fare was the bulk bin section. 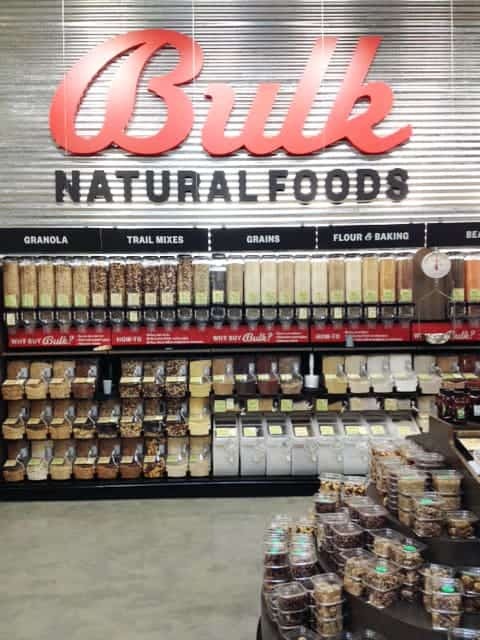 They had an amazing selection of grains, flour, and other staples you might need for your ‘cooking from scratch’ experience. The entire area was brightly lit, clean, and there was a wide selection of products to choose from. I love that there was premade trail mix and granola since we go through a lot of those two things in my house. If you are a foodie like I am, you will most likely find yourself needing a wide array of spices and assorted ‘unique’ ingredients. Earth Fare is honestly a foodie’s dream come true because they had a huge selection of spices, both conventionally grown and organic. 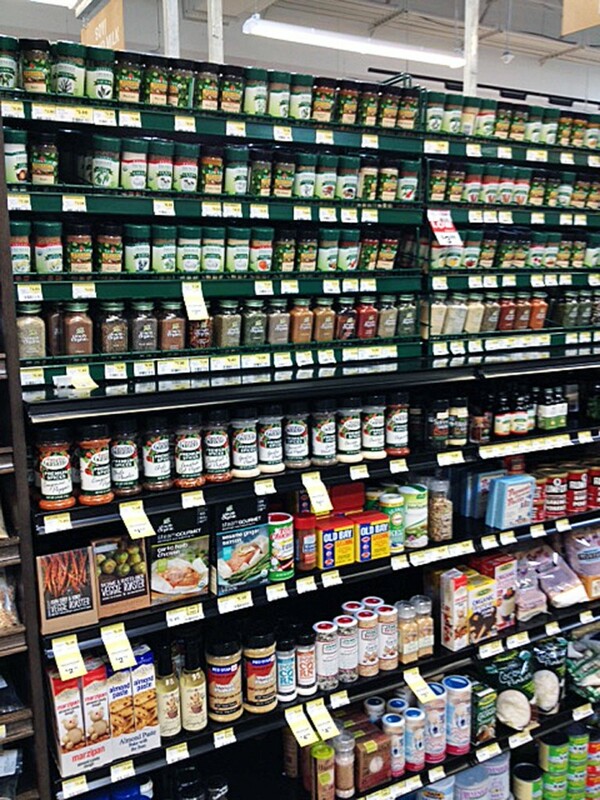 No matter if you are looking for something very common or a rather unheard of spice for an ethnic recipe, I think you will be very happy with the selection at Earth Fare! I picked up a couple of spices for my Vegetarian Burrito Bowl Recipe and headed home to start cooking. This Vegetarian Burrito Bowl Recipe took less than 30 minutes to make and most of that time was just cooking the rice. If you cook up your rice ahead of time, you can have this easy Meatless Monday recipe done in about 15 minutes. Great for a busy weeknight meal or any night you are just too tired to cook something complicated! I chose to buy mostly organic items on my trip to Earth Fare but the recipe works just fine with conventional items as well. 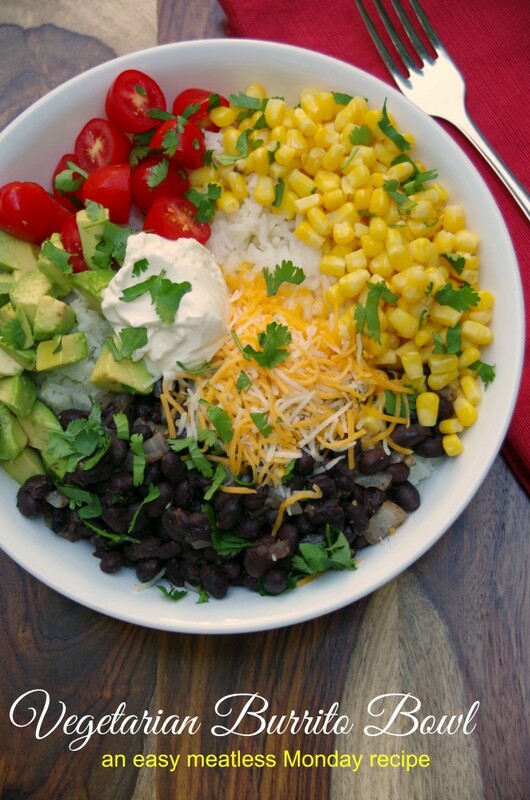 This vegetarian burrito rice bowl makes an easy Meatless Monday recipe! In a large pot, heat 2 TBSP olive oil over medium heat. Add minced garlic and saute 2 to 3 minutes. Add in rice and saute another 2 to 3 minutes until rice is starting to get fragrant. Turn down heat and cover. Simmer on low for 15 to 20 minutes or until rice is tender and water is absorbed. While rice is cooking, heat a small pot over medium heat and add in remaining 2 TBSP olive oil. Add in the black beans, chili powder and cumin. Stir and remove from heat. In a bowl, place about 1 cup of rice, 1/4 cup beans, 1/4 cup corn, a handful of cherry tomato halves, and a handful of avocado chunks. Top with a handful of cheddar, a spoonful of sour cream and a sprinkle of cilantro. Squirt a bit of lime juice over the whole thing and enjoy. Of course, since no good meal is quite complete without dessert, I also picked up all the ingredients to make this delicious Mexican dipping chocolate. With fresh strawberries in season this month, this was the perfect ending to a delicious dinner! 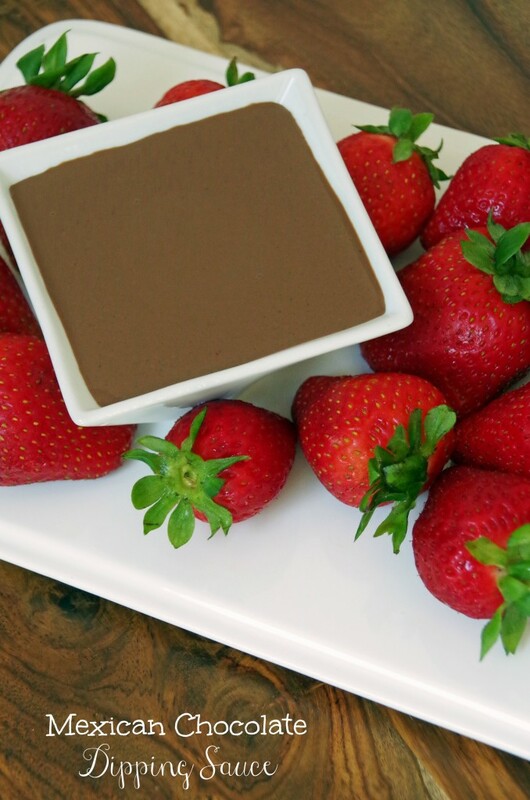 Keep your eye out this week on the blog for the recipe for this sweet and spicy chocolate dipping sauce! Let me know if you try my vegetarian burrito rice bowl recipe and I would love to know what YOUR favorite Meatless Monday recipe is! That looks really amazing. I love black beans. Great meatless Monday choice.